Texting while driving is very dangerous, and still teens resort to it a lot. As soon as they get a text, they are tempted to reply back. This has led to many fatal accidents, but there hasn’t been a credible solution to this problem. Thankfully, here is a free Android app that might just solve this problem. Can’t Text is a very thoughtfully made free Android app that automatically replies to text messages that you receive while you are driving or doing some other important activity. It comes with lot of pre-configure auto-text messages that you can choose from. Whenever you are driving, you can start this app. It will then monitor any incoming text message, and send auto-reply to them with the message that you had selected. Can’t Text even goes a step further, and disables your incoming text message tone when you start this app. This ensures that you are not distracted at all by incoming message, and can concentrate on driving. When you reach your destination, you can just check all the messages that you received, and reply to them. 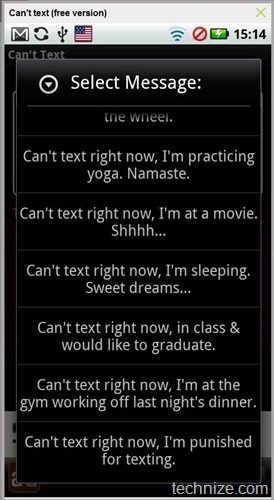 Can’t Text is also useful when you are studying, or watching movie, or doing some other activity in which you don’t want to be disturbed. If you love text messaging, then you definitely need to download this app. It will let you concentrate on activities that you need to do, and more importantly, might just save your life. This is a guest post by Ishan. He is a tech blogger, and writes about Free Software on his blog.